Very saddened to hear about the shooting in Charleston. Unfortunately, it reminded me of the church bombing in Birmingham in 1963. The gun culture in America has to be reformed. America’s history is entwined so much in violence. Our country was created and founded in a document of war declaring our independence from England. It took a war within to end the culture of slavery in our nation. When we seek to level our playing fields ie. women’s right to vote and to end segregation it often came after a fight to end its oppression. All of this including reading today that police officers (who carry guns) in Alabama with links to the KKK have been suspended. The culture of hate in our nation is not spiraling, it is out of control. To those who believe every citizen has the right to bear arms I agree with you. But I don’t believe that every citizen or any citizen needs to own a gun. More and more, I believe most police officers should not be armed with a gun. As a nation, we are at times respected and at times feared and at other times hated because of the power of our weaponry. As a leader in the global community, it will take our citizens as we have many times before, coming together to end the gun culture as we know it. It will take citizens coming together to champion for a society not predicated on violence, but one reformed by the recognition that if we don’t…..we will continue to have shootings like New Town, Connecticut where innocent little children and teachers were killed. Or Arizona, where former Congresswoman Giffords was shot. Or more Columbines and Virginia Techs. Or senseless killings in Chicago, DC and NY of innocent citizens and innocent police officers. Or more shootings of young people like Tamir Rice, Oscar Grant, Michael Brown, Trayvon Martin or Walter Scott. Or more shootings like the one last night in Charleston, SC….. Enough is enough. Let’s not make this one about race even if it is! Let’s make this about the billion dollar gun culture in America that makes people think they have power over someone else. Let’s not make this about hate. Let’s make this about the serious mental illness we have in this country. Let’s make this about something bigger than what we see on the surface. Let’s make this about US. A nation seeking to become a more perfect Union. 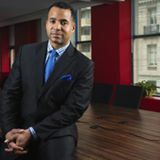 Atiba Madyun is President of The Madyun Group, a Public Affairs firm based in Washington, DC and creator of Cognitive Relevance (CR) and Party Politics (PP). Follow on Twitter @atibamadyun or Like Atiba Madyun on Facebook.